Mardi Gras season has started, and so we are devoting the next ten days to New Orleans and Fat Tuesday celebrations. 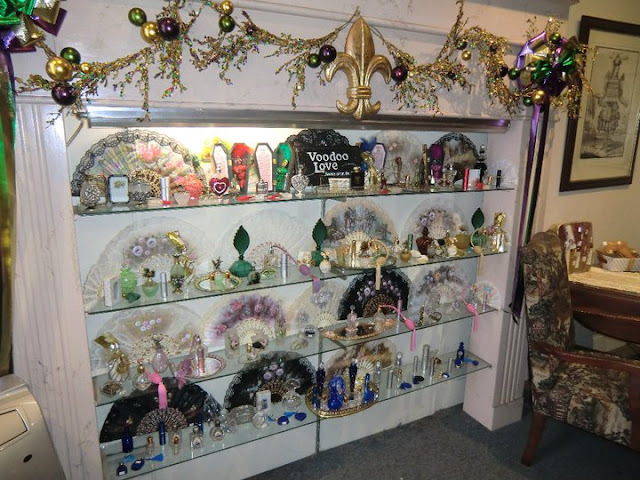 Today's post is on a perfume store in the French Quarter that has been in business for 164 years. I am talking about Bourbon French Perfumes. When I was a little girl, the height of sophistication was getting a custom blend perfume made at a little shop in New Orleans Square in Disneyland. This was not cheap so my little sister and me had to save our pennies. Disneyland's little shop stopped selling custom made perfume in the 80s and has changed wares many times. The shop now sells pre-made perfumes from fancy perfumeries instead of those custom made, but sometimes I just go in the shop to remember telling the lady behind the counter what I liked and what I didn't to make my perfect little girl perfume. It was one of those life changing experiences that help you grow up. What I know now that I didn't know then, was that Walt Disney modeled the little store in Disneyland's New Orleans Square after a real store on Bourbon Street in New Orleans' French Quarter called Bourbon French Perfumes. And Bourbon French has remained much the same, although it has moved from Bourbon Street onto one of my favorite streets in the world, Royal Street. It's much quieter there. You can see the old Bourbon French signs on top of the case. 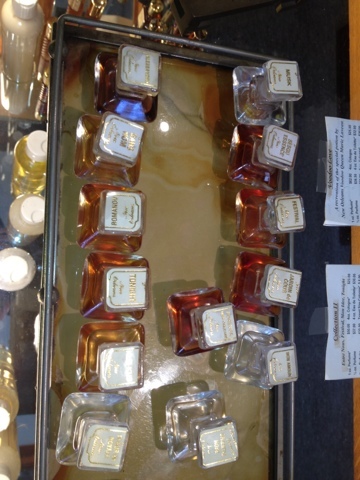 When you go in to have a custom blend made, the perfume maker will ask you all sort of questions... Do you prefer baby powder or citrus, floral or spice...and the questions go on. Once your perfume maker understands a little bit more about what you like and you don't like, they start mixing some samples. You try them on your wrists and arm (depending on how many you can handle in one sitting). There are coffee beans to clear your sniffer in between samples. You then select your perfect scent. This custom scent can be made into perfume, bubble bath and lotion. It was a wonderfully fun process. 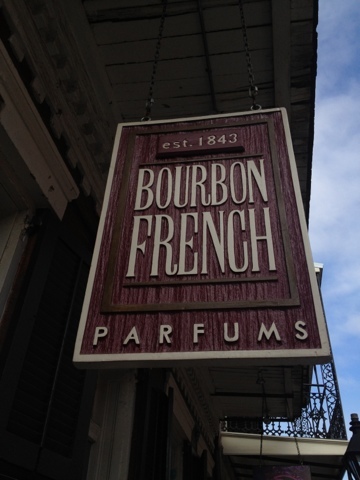 Next time you are in NOLA, I recommend that you stop at Bourbon French. This place looks amazing. It's now on my bucket list!